Convert a part or all your classroom material into eLearning Curriculums without losing the effectiveness of classroom training, while gaining all the benefits of eLearning. If we are careful and scientific in our ILT to eLearning conversion approach for training material such as PowerPoint decks, facilitator guides and participant handouts, we can come up with instructionally sound, engaging eLearning curriculums. ILT Material to eLearning Curriculums? Let’s face it. The best ILT material in the world cannot be automatically converted into an engaging, instructionally sound eLearning curriculum. You cannot take a beautifully designed PowerPoint deck, publish it with Articulate Storyline or iSpring and expect an engaging and interactive eLearning course to pop out. The content of a classroom training session will be spread over many sources – PowerPoint decks, facilitator guides and participant handouts. We need to map the existing content from all sources against the learning objectives. Most times, we come up with a number of content gaps that we fill up. Most facilitators use PowerPoint decks to structure their session and as a memory aid. PowerPoint decks usually do not have detailed narration in their notes pane but mostly just bullet points on slide and scant explanatory notes. We sit with your SME and script the entire narration to be used in the course. In an instructor-led training session, the facilitator is the main force in helping learners learn. She combines her expertise of the subject and communication skills to teach the subject. By incorporating the latest instructional design principles and practices, we make sure the eLearning is presented in such a manner that the learner will not miss the facilitator. A good trainer keeps her audience engaged with constant interaction and engagement. Again, this interaction is missing from the ILT material. Our instructional designers and authoring tool experts incorporate a number of interactivities to make the eLearning engaging and interesting. An effective facilitator ensures her learners follow her and regularly checks their understanding by asking questions – again, something that is missing in ILT material. We make sure that the course has adequate formative assessments to reinforce learning and also a final summative assessment to measure learning at the end. In addition to the standard benefits that eLearning provides in terms of cost, time, reach and convenience, there are other advantages that accrue when you convert your ILT material to an eLearning curriculum. It is common knowledge that most of the learning acquired in the classroom is forgotten within a week after training. 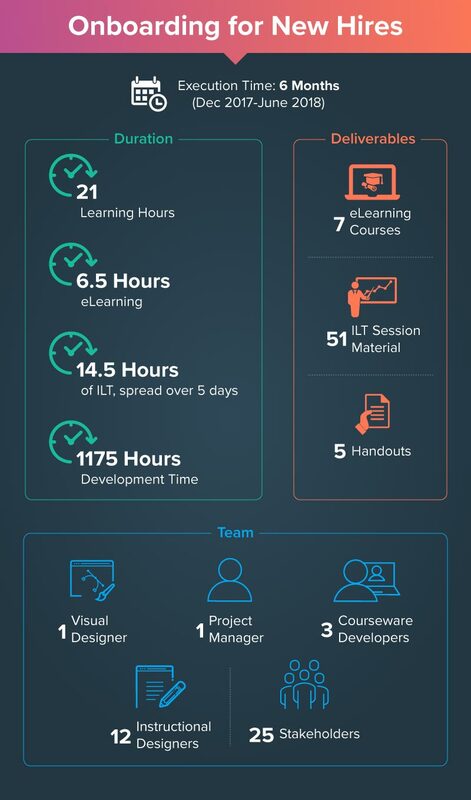 To get the maximum benefit from the conversion of ILT to eLearning, convert them into a curriculum (microlearning modules of 15-20 minutes each). eLearning curriculums increase the rates of completion, can be delivered on mobile devices and can be used as refresher and just-in-time learning. 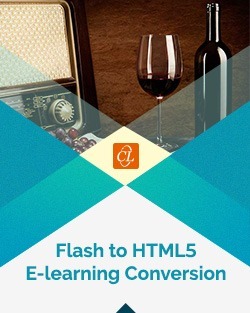 How Do You Convert ILT to eLearning? To convert any ILT material into an effective eLearning course, we need to follow a scientific, proven system. The following ILT to eLearning conversion process is one we had developed and refined over the years; a time-tested way to practically guarantee excellent quality output quickly and within budget. To get a better understanding of the learners, especially if the audience for eLearning is different from that of classroom training; To ascertain how much the learners already know about the subject. To find out where the learning takes place – at the workplace, home or hotel, or while on the move. This would help us determine the digital formats (e.g. microlearning) that can be used. To finalize the performance-based learning objectives and incorporate changes, if any. This would help us with defining the content, instructional strategy, duration and cost of conversion. To analyze the content – PowerPoint decks, facilitator guides and participant handouts – to understand the topic in detail as well as to decide on an appropriate instructional approach. By mapping the ILT content to the learning objectives, we can identify content gaps in the existing content sources. We would then try to collect the missing elements and arrive at the final content. Based on the learners and content, we need to come up with an appropriate instructional strategy to ensure the learning objectives are met. This also covers the visual strategy and design of the eLearning course. We need to ensure that the audio narration is not verbatim and complements the on-screen text. To ensure that the eLearning course has an appropriate level of engagement, we need to decide the level of interactivity. We need to incorporate multiple formative assessments per module, placing an assessment at the completion of each enabling learning objective with immediate feedback. At the end of each module, we need to present the learner with a comprehensive summary and summative assessment to measure learning. We suggest the best format(s) based on your learning need and learner profile. The trick is to ensure form follows function! Why Choose CommLab India as Your ILT to eLearning Curriculums Conversion Partner? With a strong background in classroom training, we know exactly what goes into making ILT training material, its utility and its deficiencies. As we are equally adept in designing eLearning courses, we can identity the gaps in information in the ILT material and fill them up. We then substitute the facilitator inputs with sound instructional design components such as engagements (animations and interactivities) and add assessments, both formative and summative. Our developers are adept in Articulate Storyline and Rise, Adobe Captivate and Camtasia to bring your online training to life through simulations, interactivity and engagement. For customers who want an even more immersive training experience, we use other software tools like Vyond (previously GoAnimate) to add characters and design a training environment within the simulation-based trainings. Scale – With our pool of learning and authoring tool experts, we quickly scale up the development of eLearning courses to deliver within your timelines. Process – From understanding your learning needs and analyzing your content, to finalizing the instructional strategy and developing the course, we follow an agile process that involves constant communication with you. Reusable Assets – Along with the online modules, we also provide you with all media elements along with their source files so that you can reuse them, effectively building a library of reusable digital assets. close communication with SMEs and process adherence by both parties. Quick turnaround and dedicated to seeing our project complete on time and on budget. Our project needed a vendor that was training focused. We interviewed a number of larger firms that showed little to no interest in the training piece of this project. CommLab India came in with a direct focus on what we needed to achieve and made that happen on time and on budget.